Poetry Review: Brad Richard's "Motion Studies"
Home » books » poetry » review » Poetry Review: Brad Richard's "Motion Studies"
This review is long overdue and I am indebted to Brad Richard for his recommendations for reading during my Masters, and his general enthusiasm and encouragement. I was fortunate enough to stumble across Brad's work online during a search for poetry about "mass death" and disasters. I was thrilled to discover his poem 'The Raft of Medusa', which takes Charles' Gericault's infamous painting as inspiration for a haunting poem about Hurricane Katrina, and which ultimately formed a chapter of my Masters dissertation. 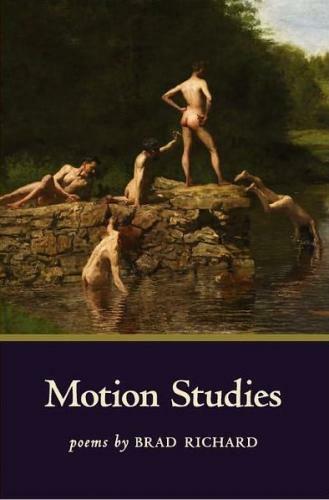 Shamefully, I have had his most recent collection Motion Studies on my book shelf for some time. It is on this rather misty day in March that I decided to pick it up. Motion Studies is a collection which takes paintings as a source of inspiration for consideration of the fluidity of time, our place in time, the role of the artist, and even the poet's own grief. Most notably, Richard uses Thomas Eakins' painting Swimming as a starting point for many musings in the book. In fact, 'Three Essays on Thomas Eakins' Swimming' is one of my favourite sequences in the collection. Motion Studies as a title, implies a fixation with moments in time (or, perhaps more accurately, the impossibility of pinpointing moments), and this sequence moves between Brad's experience as a viewer of the work, to his memories of being a young boy. As a reader I felt as though I was going through the process of discovering the male form, and he succeeds in presenting a thorough exploration of his relationship with the piece of art. I don't think I've read a poet who conveys this very personal experience as well as he does. Given my own interest in elegies, I was especially keen to read Brad's other poems about Katrina. I was not disappointed, and would pick out 'Barton Springs' as one of the most beautiful and moving poems of the entire collection. Here is a startling, intellectual poet, from whom I hope to see much more exciting work.